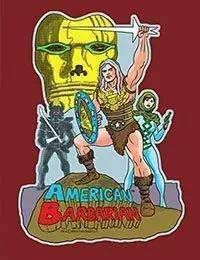 American Barbarian is an epic revenge quest across the post-post apocalyptic world of New Earthea. Meric, the titular aMERICan barbarian, survives his own personal apocalypse when Two-Tank Omen destroys everything the young warrior has ever known. Meric must fight his way through an army of zombies, mutants and robosaurs (robotic dinosaurs) on the way to his final battle with the undead cyborg pharoah. This story by Tom Scioli, co-creator of Godland, is both laugh-out-loud funny and deadly serious in the tradition of the classic comic book epics of Jack Kirby.